While potato latkes are traditionally served at Hanukkah, we would happily eat these low fat latkes any time of the year. To make them crispy, be sure to squeeze out as much moisture as you can, and preheat the cookie sheet before placing the latkes on it. 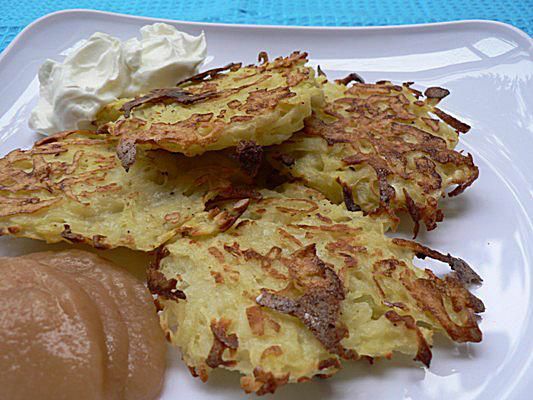 Enjoy these low fat potato latkes with fat-free sour cream and some homemade applesauce. Peel, cut, and shred potatoes and onion, using either a grater or a food processor. Place a large cookie sheet in hot oven. Empty shredded potatoes and onion into a colander, and squeeze out as much excess moisture as you can. Transfer potato and onion mixture to a large bowl. Add flour, egg whites, and black pepper, and combine well with a fork. Form 2 to 2 1/2-inch flattened rounds with the potato mixture, and place on hot cookie sheet. Return cookie sheet to oven, and cook for 7-8 minutes each side, until crisp and golden.